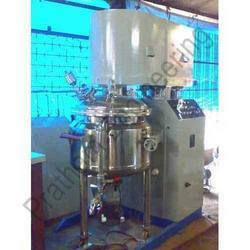 Our range of products include contra chem fab machine. We are engaged in manufacturing and supplying superior quality Contra Chem Fab that are designed as per the specification of the clients. Our products are used for production of paints, inks, coatings & construction chemicals. These products are fabricated using premium quality material under the supervision of our qualified engineers. In our range the lifting done by hydraulic mechanism to lift shaft helps in adjusting the uniform product. Also, mixing vessels is done with different capacity with heating & cooling, vacuum arrangement. Looking for Contra Chem Fab ?